I live on Herkimer. My children's school is on Herkimer, as is the park they play at. Like those that surround it, it is a street filled with homes where actual human beings live and carry out their daily lives. To use the recently-coined hashtag, #welivehere. So when Ward 8 councillor Terry Whitehead (West Mountain) recently described Herkimer Street and Charlton Avenue as "essentially main thoroughfares for residents living on the mountain," it stung more than a little. The comment was made in the broader context of criticisms of the recently installed bike lanes on these streets. Whitehead claims these lanes are causing traffic tie-ups in his ward as drivers traverse the mountain accesses to and from downtown. Setting aside the made-up "data" and sweeping generalizations that accompanied this description, Whitehead's comment is at best flippant, and at worst intentionally divisive. Herkimer and Charlton are so much more than just a traffic sewer or a shortcut to someone else's home. Safety for pedestrians through shorter crossings and buffering from traffic by bike lanes. Safety for auto traffic by reducing the need for cyclists to cut across auto lanes. Encouraging slowing traffic speeds to within posted limits by narrowing auto lanes as a psychological cue to travel more slowly. Finding an affordable and scalable model that could be implemented elsewhere in the city. Incorporating proven best practices from other cities. And, of course, goals related directly to cycling such as providing physical protection of the bike lanes, facilitating simple turns at intersections, and providing continuity to existing cycling infrastructure. Many of these goals have been realized since the lanes have been implemented, resulting in a significant improvement in quality of life for those who live here. Walking (especially with children) does feel safer. Cycling absolutely is safer. And with slower traffic speeds and not having to compete with cyclists for road space, driving, too, feels safer. Slower traffic is also safer for motorists. Several locations on the route, including Charlton at Hess, are identified as "high crash" locations that have been seen dozens of crashes (some very serious) in recent years. These lanes are not perfect. Thankfully, the downtown councillor and City staff have been open to feedback. This has already resulted in adjustments to the intersection of Park and Herkimer, with additional improvements planned to facilitate pedestrian access to the entrance of Durand Park and to improve sight lines for vehicles travelling South on Park across Herkimer. Other improvements such as better demarcation of the lanes with green paint, adding bike boxes at intersections for safer turning and adjusting the bumpout at the north east corner of Charlton and Caroline to allow the street configuration to remain more regular are all on the table and with time and persistence, may be implemented. The changing street widths and alignment has also meant the design changes from block to block, which can be puzzling to drivers and cyclists at first. Some residents with driveways directly on Herkimer and Charlton have noticed it is more challenging to back out since the reconfiguration. The narrower travel lane leaves less maneuvering space and the parked cars that remain unmoved during business hours (many of whom are employees of St. Joseph's Hospital seeking free parking) reduce visibility. Hopefully, ongoing efforts to reduce speeding and the possibility of limiting parking periods (as is consistent with other neighbourhoods in close proximity to a hospital) will mitigate this challenge. Although there is room for improvement, these lanes are already a real improvement in the lives of the thousands of people who live here (11,000 people live in Durand alone). What About Impacts to Those Who Don't 'Live Here'? This is a difficult topic to discuss without descending into us vs. them, suburban vs. urban rhetoric (as modelled by the West Mountain councillor. Personally, I hope we as citizens can rise above such divisiveness. While it has already been resoundingly demonstrated elsewhere that the Herkimer and Charlton bike lanes are not actually impacting suburban commutes, what if they were? What would be a reasonable amount of time to add to someone's commute if it meant the citizens within the neighbourhood being commuted through had a better quality of life 24 hours a day, 365 days a year? In the end, answers will vary for every individual. However, to move forward as a City on multiple fronts, we must become more collaborative, supportive, and cooperative to ensure that when we do move forward, it is with a shared interest that respects the understanding that one neighbourhood's benefit does not necessitate the detriment (perceived or actual) of another. One thing is clear: a paradigm shift is required - not only from the top down, but from the bottom up. All that being said, Herkimer and Charlton play a broader role in the City's transportation infrastructure. I do not have the expectation that they suddenly become streets where traffic is so infrequent that kids play ball hockey on them. I do expect that in upholding the City's vision - to be the best place to raise a child and age successfully - these streets can be safely navigated by all road users including children walking to school and seniors running errands. While they are not there yet, they are much closer since the bike lanes were installed. These bike lanes have been a long time coming. They originally appeared in the 2009 Cycling Master Plan (approved by Council). In the fall of 2014, implementation signs appeared with no community consultation. It turned out, the design was significantly flawed - read more here. This discovery initiated a two-year process that halted the initial implementation so a new design could be made through careful work as a collaborative effort between city staff, the ward 1 and 2 councillors and citizen representatives nominated by the Kirkendall and Durand neighbourhood associations. You can read more about that process here, here and here. It was a long and, at times, complicated process that involved widespread consultation with the relevant city departments (waste, snow removal, emergency services). There were several public meetings that were open to anyone (including residents from other parts of the city who might only commute through the neighbourhood). Finally, installation began at the end of June, 2016 and wrapped up about a month later. Great piece! As a suburbanite who has both cycled and driven Herkimer/Charlton as a quicker route home, the whole discussion has made me more aware of the ethical choices I make when commuting. For, I too, have been guilty of seeing these streets (neighbourhoods, actually), as a convenient route usually westbound for my trips from the east mountain. In a car, I should really be using the actual arterial roads (I don't think Terry Whitehead knows what those actually are). If I am to continue to drive either Herkimer or Charlton (and I hope to minimize this as much as I can), I will certainly do so with an understanding that I am sharing those streets with cyclists, pedestrians and most importantly a neighbourhood. Thanks for this perspective from a neighbourhood dweller. Thank you - it is wonderful to see this discussion lead to citizens thinking more about their driving and commuting habits! I too have become more aware of the impacts of driving through neighbourhoods. I'm definitely guilty of rushing through the Rolston neighbourhood to get my kids to swimming lessons at Westmount, but will be more careful in the future! A couple of things these lanes might need are directional arrows and some kind of solid barrier behind the first parking spot at each intersection. I've noticed multiple riders going the wrong way on Herkimer. It's not a huge deal but it makes for that awkward 'I'll go left, ok ok, u go left no me ok right ahh!' as you approach each other. Also, wouldn't having the bike lanes travel in the opposite direction to car traffic be safer on one-way streets? That way bikes could see what was coming before entering an intersection. I'm just waiting for some texter/driver to plow into the back of one of those parked cars and create a major reopening of the debate on these lanes. The pylons can't be there forever. Put down a concrete barrier with reflective arrows and move them to the side in the winter. Or barring that maybe have rumble strips and a longer approach with hash lines to the beginning of the parking spots. While the sharrows marker is normally a silly invention, I do like the sharrows-style printing on the road with a bike and an arrow saying "bike go here" for clarifying things like this. For example, in Westdale there's a tiny contra-flow lane on Cline at King that uses one, and another one on King Eastbound as it goes from two-way to one-way directing cyclists to bike onto the island. As soon as these markers fade, I start seeing cyclists get confused and cause trouble - crossing to the King lanes mid-block instead of at the island, going the wrong-way up the contra-flow lane on Cline - that one nearly caused a head-on collision for me once. The Cline/King intersection could benefit from a conventional sharrows marker to clarify to cyclists that the narrow bike lane is strictly for cyclists coming from king, not going to King. tl;dr: Sharrows are dumb for warning driver "cyclist has the right to bike in this space" but sharrows-like indicators are handy for "bikes should go in here and go in this direction" where it is non-obvious to the rider. Yes, anything to make it easier to understand which direction you should be going would go a long way to encouraging cycling. We should really be treated like we are in bike-lane kindergarten because that's not far from the truth for most people when you think about it. When this infrastructure is being designed the designers should try to get into the heads of a brand new cyclist. Someone without a clue but who would like to try to bike to the store or to work one day. We don't want that Starbucks effect - you don't how to 'properly' order whatever fancy-pants coffee they have so you just avoid it altogether. Yes, this is why Dutch one-way streets are almost always counter-flow for cyclists. For example, consider a SoBi user picking up a bike at the Durand Park SoBi station. If that person wants to travel South or West, in theory he should not ride the "wrong way" for the 20 metres to Bay Street. Instead, he should go an extra distance all the way around the block and back. Care to guess how many people actually do that? I wouldn't and I don't see it as a big deal. Same with rolling thru stop signs when it's all clear or riding on the sidewalk ( Dundurn btw King Main ) when there are no pedestrians or the grass when there are. But, if people start habitually going the wrong way for the entire stretch there will be problems just as there would be if I decided to blast down the whole stretch of Dundurn on the sidewalk. NEW YORK CITY has the Herkimer/Charlton style bike lanes. They're just clearer in parking vs biking. 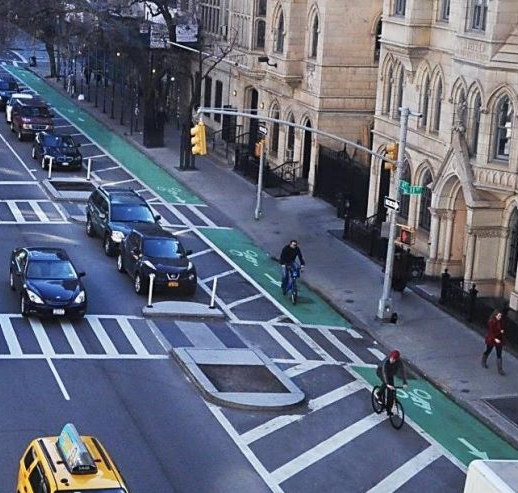 Can we ask Hamilton to please paint parking-protected bike lanes in green? Including through intersections. It'll reduce confusing and increase safety. Including improving safety and comfort for me as a car driver, when turning through a bike lane -- if they're more clearly indicated inside intersections, it alerts me to pay attention to bikes before turning. And those little concrete bits as well! Well said, Kyle. Improving the safety and liveability for the residents should be a higher priority than the speed at which commuters can race through our neighbourhoods. I only hope something can be done to slow the traffic on the Queen St hill. You may also appreciate this article from last November. GREAT article! You are absolutely correct--they clock the speed on the part of the hill where there are no homes (Beckett) but they are not clocking the speed from the curve down to Aberdeen. During non-rush hours, the speeds from that point down to Aberdeen are sometimes 60 to 90 kph. Fast, noisy, and downright dangerous to pedestrians. Also, many of the vehicles (at least a half dozen each day)hit the curb when they are speeding down the right lane--and there is NO buffer between the street and the sidewalk. Does someone have to DIE on the street before the folks in Traffic Management will realize that real people live on this street and their safety should come FIRST! Here's an easy, cheap solution: post a 30kph speed limit and enforce it! Also, since the majority of the morning and evening rush hour traffic on the Queen St. hill turns left onto Aberdeen (thus making Aberdeen another unbearable street for residents) and heads toward either 403 or Longwood, wouldn't it make more sense to create a 403 onramp up on the mountain to handle all this traffic?